Who set up NUBSLI? Nicky Evans! I got some credit recently at the ASLI 30th conference for some very important work that actually… I didn’t do. So let’s give credit where credit is due and set the record straight. I didn’t establish NUBSLI. The utterly brilliant Nicky Evans did (see pic! ), with support from Wes Mehaffy and a handful of other interpreters who understood the need for a union. I’ll tell the story of how Nicky came to set up the union but firstly let’s get this out of the way. What did I do when I was part of the ASLI board? I helped run ASLI, in accordance with its aims and objectives as a professional association. That is what you do when you’re duty bound as a Director of an association. I did some really great pieces of work like save the association £20k on the office contract and supported some working groups and regions alongside budgetary and governance decisions. The confusion comes as, like other members of Unite the Union, as soon as Nicky Evans set up NUBSLI, I transferred my membership across from the branch of NUPIT (National Union of Professional Interpreters and Translators) to the one specifically for BSL/English Interpreters. I’d been a member of NUPIT since 2010 after the shambolic MoJ contract. Four years of Union membership and finally a branch for my specific field! As a believer and supporter of unions, of collective action and with an understanding of politics I understand how we as interpreters must be political to influence those that effectively pay the majority of our wage. Government staff put in place policies and contracts that can shape the worlds of interpreters and Deaf people, for better or worse. Usually the latter, and there needs to be input from a strong Union, professional associations and organisations such as the BDA. I knew the importance of unions but it wasn’t me that established NUBSLI. Just prior to my leaving the ASLI board, after three years of hard work, I wanted ASLI to endorse NUBSLI in some way. Or to at least acknowledge the importance of its existence. This wasn’t forthcoming and there was a lot of confusion at the time about the role of unions, why interpreters even needed one and why NUBSLI would do work already being done by a professional association. Professional associations are much better placed to work on standards, education, supporting members. Collectivism is not something I ever wanted ASLI to do. Just state support for the right organisation to do that: NUBSLI. There was an ASLI board meeting, decisions about NUBSLI that I’d brought up were categorically made on the basis of facts that weren’t actually true. And I was on holiday. Amongst all of that I left having seen my viewpoint completely misunderstood and had seen Nicky and Wes’s work as Access to Work CoChairs effectively blocked and her being forced to stand down. It was a board I no longer felt part of, one that lacked fundamental understanding with an ethos I disagreed with that had started to pervade every decision. Sad? Yes. But within weeks I’d attended NUBSLI’s very first meeting and was asked to stick my hand up to be Chair. The first committee was formed and weren’t we a team! To date, it was the most productive, proactive, prolific work I have ever done as part of a committee who learnt quick, worked hard and let nothing get in our way. Nicky Evans, YOU set up NUBSLI and I salute you. As the Access to Work CoChair of ASLI, Nicky, saw the profession being eroded by government decisions that were affecting our work and the service that Deaf people were getting from us. Deaf people’s claims were revoked and slashed. Blanket decisions were made and with no strong Deaf or interpreter input everyone was suffering at the whims of the DWP. Deaf people’s work suffered. StopChanges2AtW brought Deaf and disabled people together to campaign with interpreters, but there was no effective work being done by the interpreting community. Nicky mentioned these problems to a barrister she was working with as part of the StopChanges2AtW campaign. What you don’t have a union? You better get one. She mentioned it in passing to a taxi driver. No Union? Best get in one and if you don’t, set one up. She mentioned it to a political campaign group. No Union? We’ll help you set it up. Unite the Union it was. 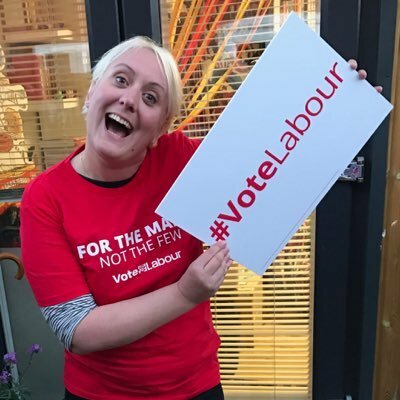 Nicky did a lot of leg work, had lots of meetings and got support from the black taxi driver’s union branch (also mostly freelancers) and her political contacts who included inspiring campaign group Disabled People Against Cuts (DPAC). This was all before it got raised at any ASLI forum or meeting. NUBSLI was born out of political need. I just happened to stick my hand in the air and become NUBSLI’s first Chair. I didn’t establish it, Nicky Evans did. Let’s give her the credit she so well deserves.